Most of us are well aware of elephants and have even seen at least one of them in person at a zoo or circus. In some of these locations you can even ride them due to their calm and gentle nature. 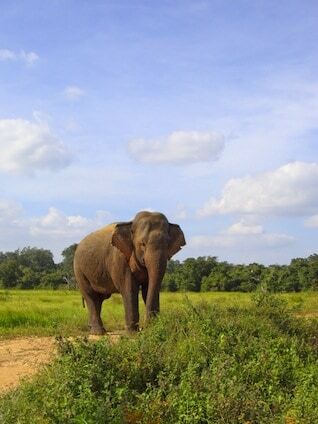 There are many great facts about the elephant though that you should learn about, and this is the place to do so. 1. Elephants are the largest of all land animals in the world. 2. It takes a female 22 months from conception to have a baby. This is longer than any other animal in the world. 3. A newborn elephant can stand up shortly after being born. They can weigh up to 260 pounds. 4. The average life span for an elephant in the wild is from 50 to 70 years. They oldest known elephant in the world lived to be 82 years of age. 5. The heaviest elephant in the world weighed 26,000 pounds. 6. The word elephant means ivory. 7. It is only a myth that elephants are afraid of mice. This legend states that the mice can run up the trunk and suffocate them but there is no truth to this at all. 8. The trunk of an elephant has more than 40,000 muscles in it. 9. Elephants are herbivores, this means that they are plant eaters. 10. Elephants consume large amounts of water – up to 15 quarts of it at once. 11. Elephants love to swim. 12. Elephants have an excellent sense of smell and hearing but poor eyesight. 13. Generally one tusk will be shorter than the other. This is because the elephant will use it more often for things. Just like people are either right or left handed it is believed that these animals rely upon a dominant tusk. 14. The tusks of an elephant can weigh up to 200 pounds and can grow up to 10 feet in length. 15. The elephant is one of the few four legged animals that can’t run. 16. At 11 pounds, the elephant has a brain that is larger than any other animal in the world. 17. For up to 16 hours a day elephants can be found feeding on a variety of plant life. They can consume from 300 to 600 pounds of food every single day. 18. Baby elephants are blind at birth and rely upon their trunks and their mothers to help them. 19. You will find that many elephants left in the wild don’t have tusks at all. This is due to the fact of so many with tusks being killed by poachers for the ivory over the years. This leaves those without tusks to take care of most of the reproduction. 20. Most elephants in zoos, working, and in the circus are females as they seem to be easier to control. Males tend to go through cycles where they are instinctively aggressive. 21. Most people don’t realize that elephants have the potential to be more dangerous than other animals. They rarely are but there is always a chance for aggressive behaviors even in those that have been in captivity for a very long time. 22. Males enter stages referred to as must where they are in a state of madness for a short period of time. 23. Females can continue to have offspring until they are about 50 years old. They tend to have a new baby every 2 ½ to 4 years. Twins are extremely rare for elephants. 24. Elephants are known to have a type of tuberculosis which can be transferred to humans. This is why those that work closely with them have to get a vaccination to prevent it. 25. Reproduction can take place any time of the year for elephants. As long as they feel secure and they have plenty of food it is something that will regularly occur.